somehow, I still think his one-hitter against the Tampa Bay Rays might be even more compelling than one of the rarest feats in baseball. There are three ways to look at Dickey’s gem. 1. Glass Half Full: Another beautiful start from the aging knuckleballer, in which he shut down a potent offense and set a Mets franchise record for consecutive scoreless innings with 32⅔, topping Jerry Koosman’s previous total from 1973. He also became the major league’s first 10-game winner, and took another step to becoming the National League starter at the All-Star Game. 2. Glass Half Empty: A stupid scorekeeper’s decision cost him a no-hitter. The lone hit of the game came in the first inning, when B.J. Upton hit a soft grounder to third. David Wright tried to field it with his bare hand, and I don’t think there’s a reasonable fan in America who thinks he wouldn’t have nailed Upton by four steps if he played it cleanly. In fact, I’m not even convinced Wright needed the bare hand. But judge for yourself. All I’ll say is this — if that play happens in New York, there’s no way in hell it’s a hit. Hell, if it happened later in the game when the no-hitter was further along, even the Tampa scorekeeper wouldn’t have had the nerve to mark a hit. The Mets are appealing the decision, but we all know how that goes. 3. Glass Shattered on the Kitchen Floor, Each Shard a Metaphor for Loss: David Wright cost R.A. Dickey a perfect f—ing game. Yup. Dickey allowed exactly two base runners in his immaculate nine innings. The first was Upton. The second came 23 batters later, in the ninth, when Elliott Johnson reached on a throwing error by Wright. He came around to score an unearned run after two passed balls and a groundout, and then Dickey finished the job without another blemish. Without those two Wright errors? Well, you could get all Michael Kay on me and talk about the fallacy of the predetermined outcome, that there’s no way to know what might have happened in the remainder of the game if Wright had made the play on Upton since we’d be dealing with an entirely different timeline. But I scoff at your amateur philosophy. The fact is, we could have had two perfect games in the same night if Wright could field his position. Dickey was robbed, once by a scorekeeper and once by his own teammate. But let’s get past that, because we should be celebrating his incredible performance. I’d love to tell you all about Dickey, but Jonah Keri already did an excellent job of that. His story — failed pitcher who reinvented himself late in life with a devastating knuckleball — is the best in the big leagues this year. 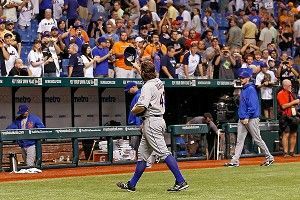 Baseball-wise, Dickey is unique among knuckleballers because he can throw it relatively fast — up to 80 mph — allowing him to avoid the frequent walks that are a hazard of the erratic pitch. On the Rays feed Wednesday night, they showed a crazy stat — to date, Dickey has faced just 34 three-ball counts, and only six 3-0 counts. In fact, he has the 15th-lowest walk rate among qualified starters, an astounding feat for a guy who shouldn’t be able to fully control the pitch he throws 84.6 percent of the time. Certain at-bats show the insane amount of movement on his pitch (and come with great reactions, like Will Rhymes simply laughing or Matt Joyce looking utterly hopeless), but it’s even better in slow-motion replay. it’s all supposed to impart spin to a moving object. That’s the familiar formula: spin equals movement, no spin equals stationary. So when someone throws a ball with no spin, utilizing the intentional random tumbling of the Magnus effect, it feels like a stationary object is defying space by coming at you. Forget the jerky movement of the ball, which is bad enough — it’s bizarre that it’s even moving. It’s like those terrifying scenes in horror films where someone or something approaches, without twitching a muscle, through the use of multiple jump cuts. Those twin girls from The Shining, for example, are knuckleballing all the way. Even Lancelot must have knuckleballed off-camera when he attacked Castle Python. And when you defy space, you also defy time. It’s why you get a weird feeling even when you’re playing catch with a friend and he throws a poor knuckler. It takes a split second to overcome one of the basic foundations of our lives — movement requires spin — and adjust. Curveballs, sliders, screwballs: They all make sense. We understand twists and turns. But the knuckleball is practically extraterrestrial. That’s just one reason why R.A. Dickey is the most fascinating baseball player in the major leagues, and why I dearly wish David Wright had made a couple routine plays in Tampa.